13 November, UNFCCC, Warsaw Poland - When you are far from home it is always welcoming to see a familiar face! Aminiasi Boseniyasana was one of several members of the UN Security patrolling at the UNFCCC COP 19. He along with four others from Fiji are based in the Hague. 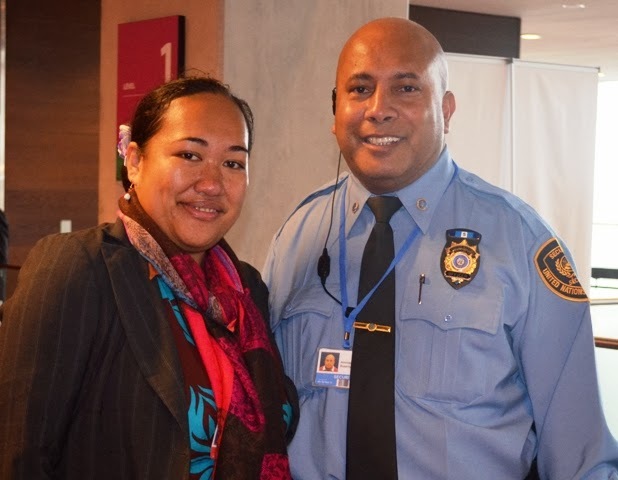 Coming from a Police and military background, Boseniyasana has worked for the UN Security for nine years. He was also part of the UN Security team at the UNFCCC COP 15 in Copenhagen in 2009.
inShare13 November 2013, UNFCCC COP 19, Warsaw Poland - In the lineup of 12 young people chosen to be 2013/2014 fellows for the Adopt a Negotiator Project there is one face from Fiji - Mr. Krishneil Narayan. He was awarded a fellowship to be part of a team that tracks the negotiations aiming to translate the process so that it is understandable. "One of the reasons engagement in global negotiations is so hard is because they are complex, dry, and full of language that no one outside the system can understand. That's where we come in. As a group of independent young people writing from our own perspectives, we give you a raw take on who is doing what in this effort. We tell it like it is, with all the emotion that comes with failure or with progress. We bring a human element to a too soulless process." The Adopt a Negotiator project is supported by the Global Campaign for Climate Action with updates from the Negotiation trackers shared through social media sites at regular intervals. 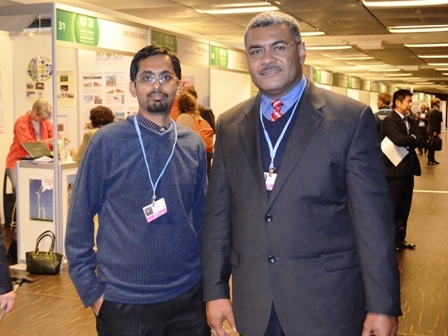 While at the 19th Conference of the Parties to the United Nations Convention on Climate Change (UNFCCC COP 19) Krishneil will be following the work of the Fiji delegation. Fiji plays an important role at this conference as the Chair of the G77, a negotiating bloc of over 130 nations. "I was really delighted to be selected for this fellowship, I have worked with the Adopt a Negotiator trackers in the past and have found them to be inspiring," said Narayan. "We basically track the negotiations and negotiators and write about the process in a way that those outside of the conference venue can understand why these negotiations happen and how it relates to their daily lives. As much as possible we try to give the negotiations a human face." Narayan is no stranger to the UN Climate negotiations. He first attended the 15th Conference of the Parties in Copenhagen four years ago as one of the Pacific youth delegates that were part of the Project Survival activity. Since then Narayan has remained an advocate in the campaign against climate change through Project Survival Pacific. "The Pacific islands are one of the least represented groups at the UN Climate conference and it's very difficult to navigate through this huge negotiation process with such a small group of people. My aim is to engage more young people through Project Survival Pacific as these negotiations are all about the people back at home." For the UNFCCC COP 19, the 12 trackers are from all four corners of the globe; India, Philippines, New Zealand, Kenya, Nigeria, Fiji, Poland, Ukraine, Brazil, Middle East and North Africa region, Peru and China. 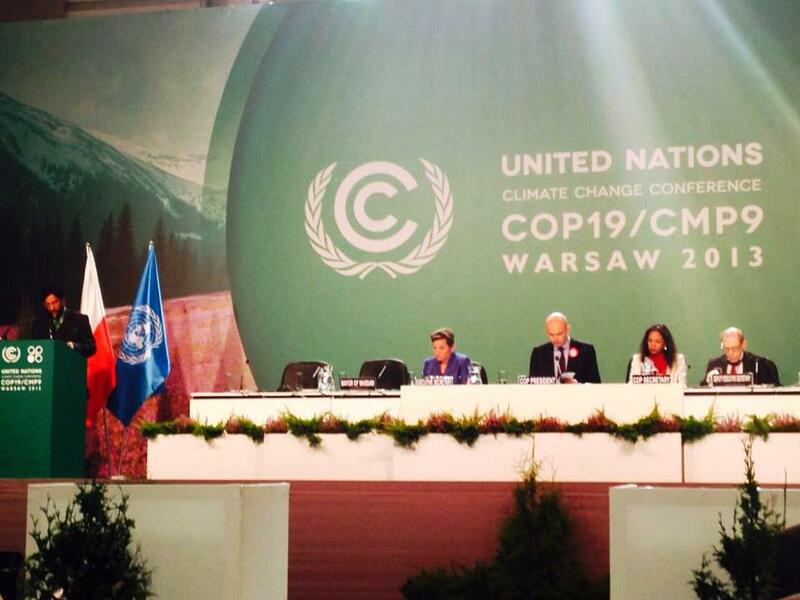 Read more about their perspectives of the UN climate talks in Warsaw Poland. 12 November 2013, UNFCCC COP 19, Warsaw Poland - In just over a year, 50% of the Cook Islands will be powered by renewable energy and then five years later in 2020 this will increase to 100%. These targets set by the Government of the Cook Islands were announced at a special event in Warsaw, Poland this week, to show the diverse ways parties to the United Nations Framework Convention on Climate Change (UNFCCC) are reducing their greenhouse gas emissions. While it is estimated to cost the nation over NZD 220 million dollars to achieve its 100% renewable energy target, the benefits in the long run are worth the investment. 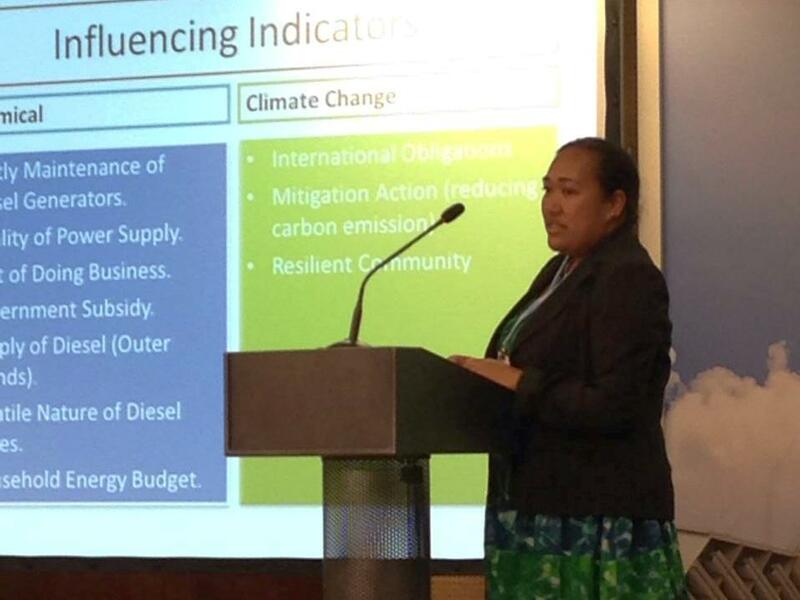 "The Cook Islands are the first Pacific island nation to register our NAMA, the Nationally Appropriate Mitigation Action, with the UNFCCC," said Ms. Mii Matamaki of the Cook Islands delegation after delivering a presentation on the Cook Island NAMA. "It outlines how we intend to achieve our targets and reduce our greenhouse gas emissions to help mitigate climate change, these are plans that we have already started to implement. This was presented at the event which had a good outcome for us - we received interest from a possible donor to support us to continue implementing this plan of action." A NAMA is a voluntary plan of action that outlines how parties intend to uphold their commitment to reduce greenhouse gas emissions that will mitigate climate change through different actions. These are then registered with the UNFCCC to help seek support to carry out these actions and it's also the shows a country's commitment to slow global warming as a party to the UN Climate Convention. The Cook Islands registered their NAMA in January this year. The Nationally Appropriate Mitigation Action was developed through a project by the Secretariat of the Pacific Regional Environment Programme (SPREP) to form a NAMA guideline for the Pacific and then testing it out in a Pacific Island Country. The result was a user-friendly guide and step-by-step process that Cook Islands successfully applied in practice. "Our goal for 100% renewable energy is to help ensure an economically feasible way of living for residents on our islands. It's getting so expensive to run our electricity both at government level and for our households but it's an added bonus in that through using renewable energy we are also being environmentally responsible as well," said Matamaki. There are 14 power stations throughout the 12 inhabited islands that rely on imported fuel. The challenges of ensuring fuel reaches these islands to power their generators, at an affordable cost, is ongoing and not always overcome. "Many of our people now have a lifestyle whereby electricity has become a part of their life however the cost of fuel is a major burden for families. We only anticipate good outcomes all round once we achieve our target with support from partners - families will have power at a cheaper cost and our island nation will have reached low carbon development." The special event on NAMA's at the 19th Conference of the Parties to the United Nations Framework Convention to Climate Change was held on Monday, 11 November. The UNFCCC COP 19 takes place in Warsaw, Poland from 11 to 22 November. The NAMA guideline was developed by the Global Climate Change Consultancy and SPREP, with significant inputs from Cook Islands stakeholders. It was funded by the Taiwan/ROC Regional Development Assistance programme and the Pacific Island Greenhouse Gas Abatement through Renewable Energy Project. 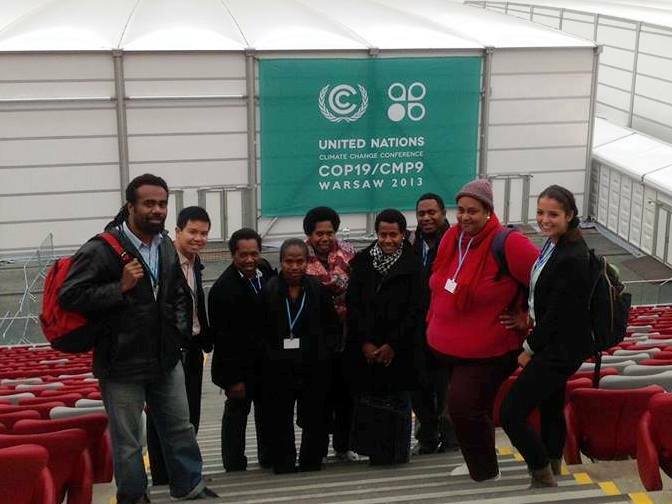 11 November 2013, UNFCCC COP 19, Warsaw Poland - Vanuatu is serious about raising their climate change concerns at the international level. The island nation has a 15 strong delegation including a cabinet minister at the 19th Conference of the Parties to the United Nations Framework Convention to Climate Change (UNFCCC COP19), all of whom were part of a six month project to prepare for the global negotiations. As part of this project delegates were selected to represent Vanuatu and participate in a range of different activities to develop national positions, prepare ministerial cabinet briefings, undergo negotiations training and a workshop to assign different roles and responsibilities within the delegation. "Our delegation is wide and varied, we have members from the government, civil society, youth groups and private sector," said Mr. Albert Williams of Vanuatu. "We prepared our delegation to be well informed of our key issues of finance, gender balance, adaptation and so forth, before coming here. The COP is tough and that's why we wanted them to have a feel of the realities of this event before coming to Warsaw so our delegation is better prepared." Vanuatu were one of the first nations in the world to relocate a community due to climate change impacts. The Tegua relocation programme began in 2002 and resulted in 100 residents moving inland due to coastal inundation impacting on their homes and drinking water. The climate change impacts continue to be felt by the residents of Vanuatu with water shortages, coastal inundation and erosion of coastlines, relocation of government infrastructure and effects on food crops. For Vanuatu the global climate change negotiations are vital to the survival of their way of life and investing in a well-prepared national delegation demonstrates their commitment. "I think we achieved so much in such a short time with our six month preparation project," said Charlotte-Fleur Cristofari, coordinator of the project that is led by the Vanuatu National Advisory Board on Climate Change - Project Management Unit. "We've made history for Vanuatu on different levels: we made our first two submissions to the UNFCCC on Gender Balance and Direct Finance; this is our largest delegation ever with over 15 members, including a large female contingent, which is a first too." As part of preparation for the Vanuatu delegation, they underwent a one week negotiations skills training by the Secretariat of the Pacific Regional Environment Programme (SPREP), helping to provide first time delegates with a background view of what to expect at the climate negotiations. It was through this project that other sectors were also provided the opportunity to strengthen their awareness and understanding about the UNFCCC COP. A seminar was made to students at the Emalus Campus of the University of the South Pacific; a national youth and climate change day was held across the 6 provinces of Vanuatu and; national media also underwent a one day training facilitated by SPREP. The pilot project is funded by AusAid, through Oxfam and SPC-GIZ Climate Change Vanuatu. It is supported by the National Advisory Board on Climate Change- Project Management Unit, Vanuatu Climate Adaptation Network (VCAN), SPREP, Melanesian Spearhead Group (MSG), USP and Vanuatu Broadcasting and Television Corporation. The UNFCCC COP 19 is hosted in Warsaw, Poland from 11 to 22 November. "AOSIS has long advocated a science-driven, robust and ambitious response to the climate challenge. We are here to play our part in ensuring that we live up to our responsibility to our people and future generations, and we assure you of our support as we fight for our survival and work to ensure a safe climate future for all." - Alliance of Small Island States. 11 November 2013, UNFCCC COP 19, Warsaw Poland - The Alliance of Small Island States asked the international community today, to reflect on whether it is living up to the commitments made to each other over two decades ago, to tackle and find solutions to climate change with the establishment of the UNFCCC. The opening of the 19th Conference of the Parties to the United Nations Framework Convention (UNFCCC) to Climate Change was the backdrop for the call from AOSIS. "In the immediate wake of Super-storm Haiyan, one of the strongest storms in recorded history, which left a wake of destruction across Palau, Micronesia, and most severely in the Philippines, it is hard to claim that we have," said Ms. Lara Daniel of Nauru, speaking on behalf of AOSIS during the opening. "Our thoughts and prayers go out to the victims of this horrific tragedy. It is a cruel reminder for all of us regarding what is really at stake at these talks. We should also recall that last year's conference began with the aftermath of Hurricane Sandy as a backdrop." The 14 Pacific islands represented at the UNFCCC COP 19 negotiate at the international climate change conference together as part of the Alliance of Small Island States (AOSIS) a coalition of 44 states and observers from small island and low-lying coastal countries. Together, Small Island Developing States communities constitute some 5 percent of the global population, they are the most vulnerable to the impacts of climate change. AOSIS is calling for progress to be made at this COP on a legally binding protocol under the UNFCCC to be adopted no later than 2015 to keep global warming well below 1.5 degrees. This protocol must ensure there is no backsliding in the type, nature, or ambition of mitigation commitments. "For many island nations, the cost of more extreme weather events has been mounting for some time: in the toll it is taking on our oceans and reefs; in the damage it is causing our food and water supplies; in the loss of our coastlines and parts of our sovereign territories; and, sadly, in the many lives lost," said Daniel. "The safety, viability and survival of our members demands that the agreement be based on best science and therefore include a global goal of keeping warming well below 1.5 degrees." This year the 19th Conference of the Parties to the United Nations Framework Convention to Climate Change (UNFCCC COP 19) is hosted by Warsaw, Poland from 11 to 22 November. 11 November 2013, UNFCCC COP 19, Warsaw Poland - Sobering messages were delivered at the opening of the 19th Conference of the Parties to the United Nations Framework to Convention on Climate Change in Warsaw, Poland today. Findings of the 5th Assessment Report of the Intergovernmental Panel on Climate Change were presented by the Chairman of the IPCC, Dr. Rachendra Pachauri, strengthening the call for urgent action. According to the overview, each of the three decades has been successively warmer at the Earth's surface than any preceding decade since 1850 and it is extremely likely that human influence has been the dominant cause of the observed warming since the mid-20th century. Since the early 1970's, glacier mass loss and ocean thermal expansion from warming together explain about 75% of the observed global mean sea level rise. "Mahatma Gandhi said A technological society has two choices. First, it can wait until catastrophic failures expose systematic deficiencies, distortion, and self-deceptions...secondly, a culture can provide social checks and balances to correct for systematic distortions prior to catastrophic failures," said Dr. Pachauri. "I hope this would be the kind of direction in which our discussions would take place supported by the science and findings that we have brought up in the report of the IPCC." On the 95th anniversary of independence for Poland the President of the UNFCCC COP 19 called for the world to close ranks and act together, referring to the typhoon tragedy in the Philippines as an 'awakening'. "I say awakening because it is yet another proof that we are losing this unequal struggle between man and nature. It got the better of us yet again, and will continue to do so in the future if we do not close ranks and act together to strike back. Climate is a global issue, global problem and global opportunity at the same time," said His Excellency, Mr. Marcin Korolec during his opening statement. "It is a problem if we cannot concert our efforts. It becomes an opportunity where we can act together. One country or group cannot make a difference but acting together, united as we are here, we can do it." All 14 Pacific Island Countries that are members of the UNFCCC are represented at the global conference on climate change, as well as delegates from Tokelau who are attending as part of the New Zealand delegation. Although they contribute to less than 1% of the world's total greenhouse gas emissions, the Pacific islands are amongst the most vulnerable to the impacts of climate change. It's here in Warsaw, Poland that the Pacific region is hopeful their voice will be heard and action is taken to lower global temperatures. Ms. Christiana Figueres the Executive Secretary of the UNFCCC called for a level playing field in the face of climate change. "There is no doubt that climate change has created an unlevel playing field for future generations. Previous generations unknowingly had an advantage; and now we know that future generations face a monumental uphill struggle. We must urgently level the playing field." The international political response to climate change began with the adoption of the UNFCCC in 1992, which sets out a framework for action aimed at stabilising atmospheric concentrations of greenhouse gases (GHGs) to avoid "dangerous anthropogenic interference with the climate system." The Convention, which entered into force on 21 March 1994, now has 195 parties. The 19th Conference of the Parties to the United Nations Framework Convention on Climate Change is held in Warsaw, Poland from 11 to 22 November. All 14 Pacific island countries are represented at these climate negotiations. AOSIS has a membership of 44 States and observers, drawn from all oceans and regions of the world: Africa, Caribbean, Indian Ocean, Mediterranean, Pacific and South China Sea. Thirty-seven are members of the United Nations, close to 28 percent of developing countries, and 20 percent of the UN’s total membership. Together, SIDS communities constitute some five percent of the global population. Member States of AOSIS work together primarily through their New York diplomatic Missions to the United Nations. AOSIS functions on the basis of consultation and consensus. Major policy decisions are taken at ambassadorial-level plenary sessions. The Alliance does not have a formal charter. There is no regular budget, nor a secretariat. With the Permanent Representative of Saint Lucia as its current chairman, AOSIS operates, as it did under previous chairmanships, out of the chairman’s Mission to the United Nations. AOSIS’s first chairman was Ambassador Robert Van Lierop of Vanuatu (1991-1994), followed by Ambassador Annette des Iles of Trinidad and Tobago (1994-1997), Ambassador Tuiloma Neroni Slade of Samoa (1997-2002), Ambassador Jagdish Koonjul of Mauritius (2002-2005), Ambassador Enele Sopoaga of Tuvalu (acting chairman 2005-2006), Ambassador Julian R. Hunte of Saint Lucia (2006), Ambassador Angus Friday of Grenada (2006 – 2009), Ambassador Dessima Williams of Grenada (2009-2011), and the present chairperson, Ambassador Marlene Moses of Nauru.